ICD-11 Beta drafting platform to launch in May? As reported in previous posts, according to the timeline, the ICD-11 Beta drafting platform is supposed to be launching this May. ICD-11 Revision Steering Group has yet to announce whether the Beta platform remains on target for a May release and if so, on what date it will be launched – so I cannot give you a date yet. Like the Alpha Drafting Browser, the Beta drafting platform will be a work in progress – not a final Beta draft. 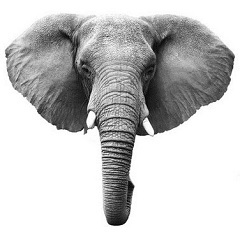 The final Beta isn’t scheduled until 2014, after the ICD-11 field trials have been undertaken. When it does launch, the Beta platform is intended to be accessible to professionals and the public for viewing. Registered or logged in users will have greater access to content and will be able to interact with the platform to read comments, comment on proposals and make suggestions, as part of the ongoing drafting process. The various ICD-11 Revision Topic Advisory Groups are carrying out their draft preparation work on a separate, more complex multi-author drafting platform that is accessible only to WHO and ICD Revision personnel. the Alpha draft is a work in progress; it is incomplete; it may contain errors and omissions; it is in a state of flux and updated daily; textual content, codes and “Sorting labels” are subject to change as chapters are reorganized and content populated; the content has not been approved by Topic Advisory Groups, Revision Steering Group or WHO. It is possible to register, or sign into the platform using existing accounts with several third party account providers such as Google, Yahoo and myOpenID, for increased access and functionality. Once signed in, Comments and Questions can be read and PDFs of the drafts of the top level linearizations can be downloaded from the Linearization tab. ICD-11 will be available in both print and online versions and unlike most chapters of ICD-10, will include descriptive content for ICD terms. For the online version of ICD-11, all ICD entities will include a definition and a number of additional key descriptive fields – between 7 and 13 pre-defined parameters, populated according to a common “Content Model” (Content Model Reference Guide January 2011). *According to the iCAT User Google Group message board, these fields may have been revised since the January 2011 Content Model Reference Guide was published; Content Model parameters in the Beta draft may therefore differ from those currently displaying in the public Alpha drafting platform. The print version will use a concise version of Definition due to space constraints. In the Alpha Browser, not all these Content Model parameters display in the Foundation and Linearization views and not all of the parameters that have been listed for individual entities have had their draft text added yet, as some chapters are more advanced for the population of proposed content than others. So the Alpha draft is still very patchy and many entities have no Definition and little or no other proposed content filled in. With no “Category Discussion Notes” or “Change history” pop-up windows visible in the public version of the Alpha, the viewer cannot determine the rationales behind the reorganization of terms and hierarchies within the various chapters. 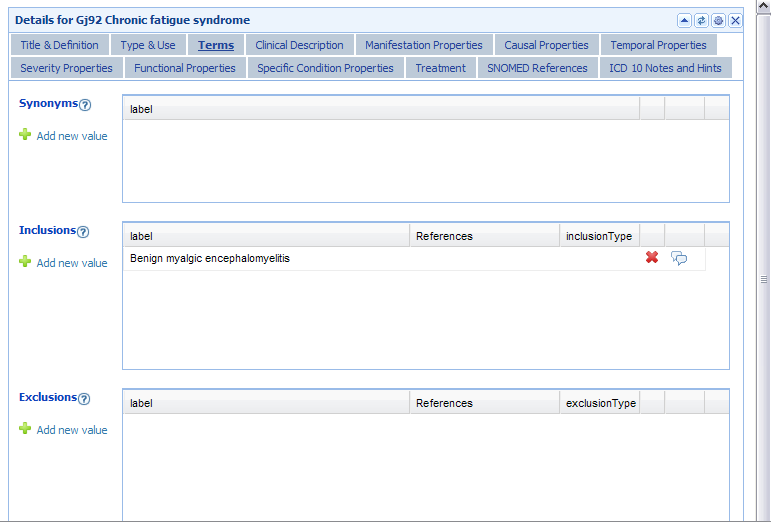 2] That “Chronic fatigue syndrome” had been designated as an ICD-11 Title term within ICD-11 Chapter 6: Diseases of the nervous system, with the capacity for a Definition and up to 10 additional descriptive parameters. What is currently showing in the Chapter 6 Foundation Component? 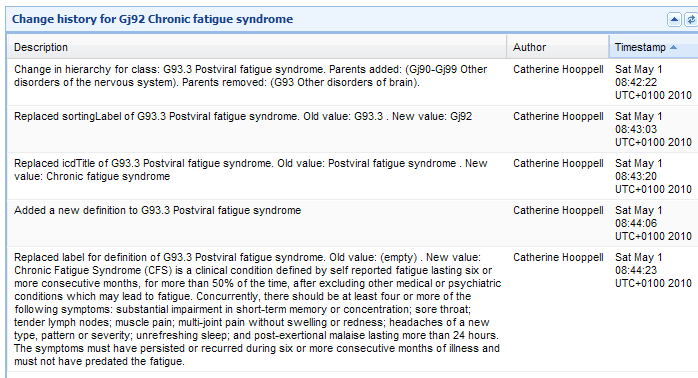 It isn’t possible to bring up a discrete ICD Title listing for either “Benign myalgic encephalomyelitis” or “Postviral fatigue syndrome” in either the Foundation Component or the Linearization. one term has recently been added under “Narrower Terms”. This entity does not have a definition at the moment. What’s new in Chapter 5: Mental and behavioural disorders? 5M2 Severe bodily distress disorder. None of these three new (proposed) categories have had any Definitions or other textual content added to the description panels on the right hand side of the Alpha Browser page since I first reported this change in February. It is still not possible to determine what disorders ICD-11 intends might be captured by these three new (proposed) terms, should ICD-11 Revision Steering Group and WHO classification experts consider these terms to be valid constructs and approve their progression through to the Beta draft. 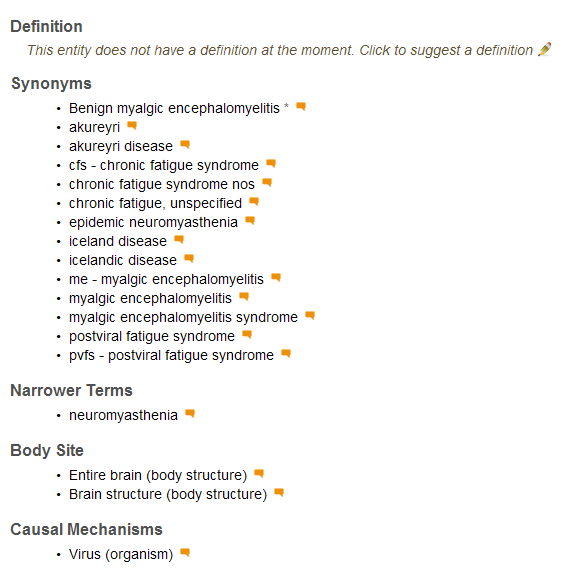 how these three (proposed) new terms would relate to the existing ICD-10 “Somatoform Disorders” categories which remain listed as child categories to “BODILY DISTRESS DISORDERS” (apart from “Hypochondriacal disorder” [ICD-10: F45.2], which is now listed as “5H0.5 Illness Anxiety Disorder” in the ICD-11 Alpha Draft). 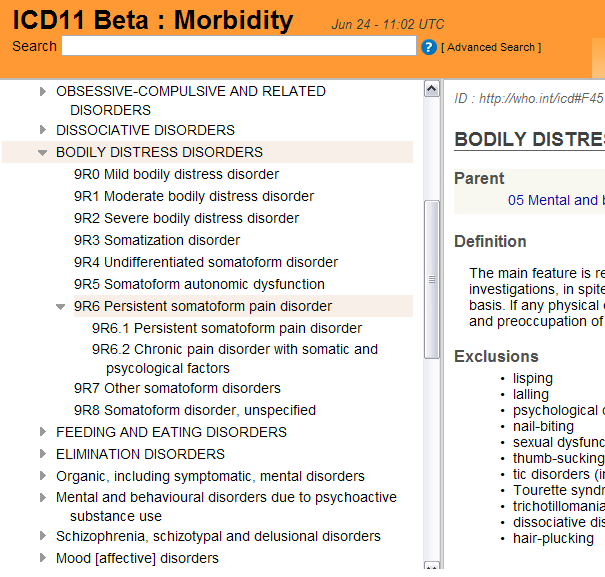 “Bodily Distress Disorders” to replace “Somatoform Disorders” for ICD-11? The information in this report relates only to proposals for the WHO’s forthcoming ICD-11; it does not relate to ICD-10 or to the forthcoming US specific “clinical modification” of ICD-10, known as ICD-10-CM. Codes assigned to ICD-11 Beta draft categories are subject to change as chapter reorganization progresses. Images and text in this posting may not reflect the most recently assigned codes. This post has been updated to reflect the launch of the Beta drafting platform and revisions to codes assigned during the drafting process as they stand at June 24, 2012. This report contains an important update on proposals for ICD-11 Chapter 5: Mental and behavioural disorders. In a February 16, 2012 report by Tom Sullivan for Health Care Finance News, Christopher Chute, MD, who chairs the ICD Revision Steering Group, warned of a possible delay for completion of ICD-11 from 2015 to 2016. The ICD-11 Beta drafting platform was launched in May 2012. The Beta drafting platform is a publicly viewable browser similar to the Alpha drafting platform that had been in the public domain since May, 2011. The Morbidity Linearization is the view that includes (what may be temporarily assigned) sorting codes. These codes are likely to change as chapter organization progresses. Click on the small grey arrows next to the chapters and categories to display parent > child > grandchildren hierarchies. Click on individual terms to display descriptive content in the right hand frame of the Beta Browser. Textual content for ICD-11 is in the process of being drafted and the population of content for some chapters is more advanced than others. 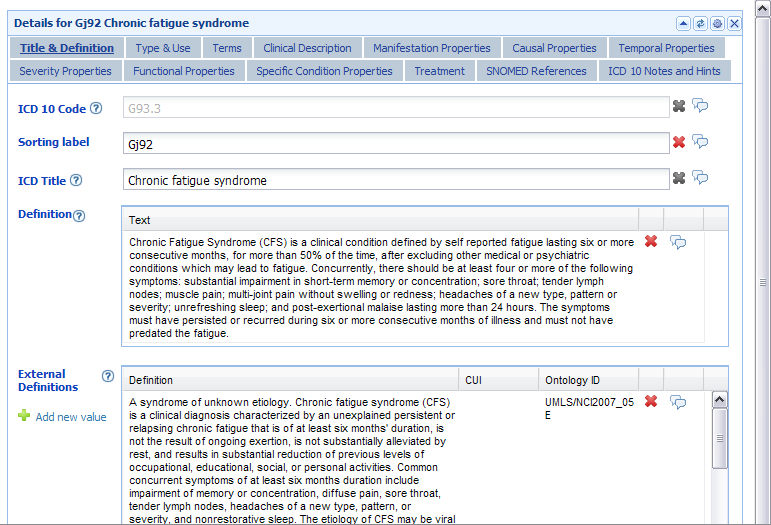 Content for some of the “ICD-11 Content Model” parameters may display: ID legacy code from ICD-10 (where applicable); Parent(s); Definition; Synonyms; Inclusions; Narrower Terms; Exclusions; Body Site; Causal Mechanism; Signs and Symptoms. This page of the User Guide sets out differences between Foundation view and Morbidity Linearization view. The various ICD Revision Topic Advisory Groups (TAGs) are carrying out their work on a separate, more complex, multi-author drafting platform. On their platform, editing histories and “Category and Discussion Notes” are recorded so the progress of proposals and reorganization of ICD entities can be tracked, as the draft evolves. For the Beta drafting platform, interested stakeholders may register for increased access and interaction with the drafting process by submitting comments and suggestions on draft content and proposals. For those registered for increased access, it is possible to download PDFs of drafts for the “Print Versions for the ICD-11 Beta Morbidity Linearization” for all 25 chapters of ICD-11. These are obtainable, once registered and logged in, from the Linearization > Print Versions tab. I’m going to reiterate the ICD-11 Alpha Browser Caveats because it’s important to understand that the ICD-11 Beta draft is a work in progress – not a static document – and is subject to change. The draft is updated on a (usually) daily basis; when you view the Beta Browser, you are viewing a “snapshot” of how the publicly viewable draft stood at the end of the previous day; not all chapters are as advanced as others for reorganization or population of content; the draft is incomplete and may contain errors and omissions. The codes and “sorting labels” assigned to ICD parent classes, child and grandchildren terms are subject to change as reorganization of the chapters progresses. The Beta draft has not yet been approved by the Topic Advisory Groups, Revision Steering Group or WHO and proposals for, and content in the draft may not progress to the Beta drafting stage; field trials have not yet been completed – so be mindful of the fact that the draft is in a state of flux. As it currently stands, the Beta draft lacks clarity; not all textual content will have been generated and uploaded for terms imported from ICD-10 and there may be no definitions or other textual content displaying for proposed new terms. I won’t be reporting on specific categories in Chapter 6 in this post but will do a follow up post for Chapter 6 in a forthcoming post; again, there is a lack of clarity for Chapter 6 and requests for specific clarifications, last year, from the chair of Topic Advisory Group Neurology and the lead WHO Secretariat for TAG Neurology have met with no response. 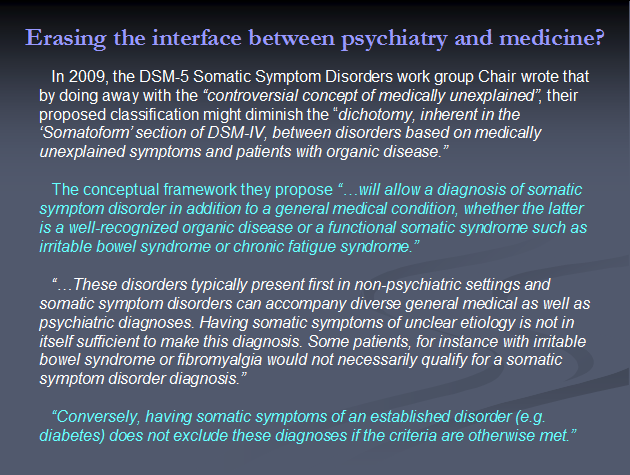 Continued on Page 2: Somatoform Disorders in ICD-10; Somatoform Disorders to Bodily Distress Disorders for ICD-11?